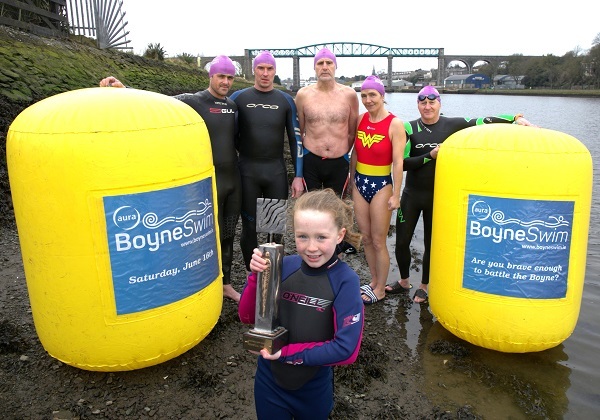 Drogheda Triathlon Club will host the Aura Boyne Swim 2018 once again with the continued and greatly appreciated support of Drogheda Port Company and Louth County Council. The hugely experienced swim coaching teams at Aura Leisure have combined their expertise to put together a training program for the swim that will be free to all participants for download on the Aura Leisure and Boyne Swim websites and will be available to pick up in all of the Aura Leisure centres from February 12th, 2018. Aura Leisure will also have a range of tailored swim courses for those who need to improve the swim stroke and stamina before the big swim! A special thanks to our friends who braved the cold for our promo photo shoot, Andrew Jein (Drogheda Triathlon Club), Ken Shevlin (Drogheda Triathlon Club), Ray Donagh (Drogheda Triathlon Club), Louise Purcell (Winner of Boyne Swim 2017, Ladies), Mark Kimmins (Drogheda Triathlon Club) and the very special Boann Rock-Tivnan (Youngest Competitor for 2018).